Amid the havoc caused by cyclone Ockhi, Defence Minister Nirmala Sitharaman on Saturday said that she will not lose hope and will leave no stone unturned in finding the fishermen stranded in the sea. "I will not lose hope even for a minute, because if the boats, which went out 15 days back, can come back with the fishermen alive, then we will make every attempt to bring everyone back," Sitharaman told reporters here. The Defence Minister further informed that 11 fishermen are also accompanying the Navy in the search operations. "Fishermen were asking if they could join the search operations, and I agreed. Now 11 of them are already in search helicopters, so with the cooperation of fishermen, we will continue our search and rescue teams," she said. Giving a rundown of the operation carried out by the Indian Navy, the Defence Minister said that she is duly updated every hour by the officers in the navy and the coast guard about the whereabouts of those found. "I have spoken to the Chief Minister of Maharashtra to ensure that those boats, which have reached there, be given safe care and share of food, clothing and everything. When the seas are calmer, they can come back," Sitharaman added. The Defence Minister was in the city to meet the families of fishermen affected by cyclone Ockhi. At the onset of the severe cyclone that jolted the southern part of the country, several naval ships were deployed for rescue operations. 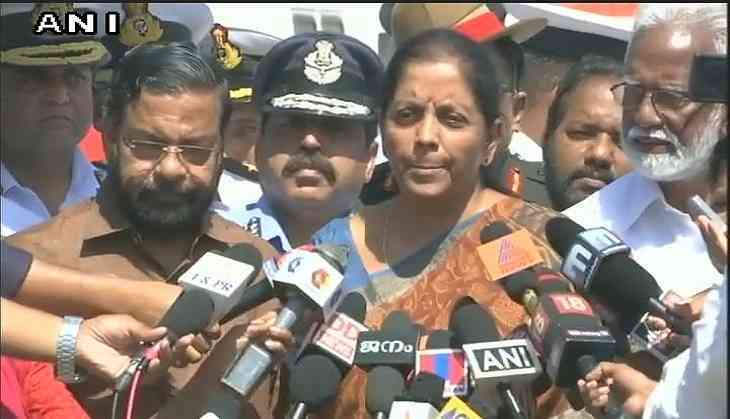 Sitharaman, on Friday, had confirmed that six warships and two coast guard ships were deployed along with additional air effort.